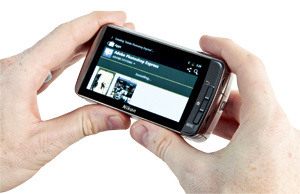 Most of the handling of the S800c revolves around its wonderfully bright and crisp 819,000-dot OLED touchscreen. The fixed 3.5in monitor dominates the rear of the camera and is clear to view in bright daylight. Be it adjusting the sliders for exposure compensation, using the touch shutter or typing an email, the screen is responsive, too. A home button accesses the main menu where the shooting, playback, browser and apps can be selected. Downloading an app works much in the same way and speed as a smartphone. Full-resolution files from the camera are bigger than those from most phones, and the uploading and editing process can therefore feel a tad slow using some of the popular photography apps. As the camera is a new Android device, some bugs may need to be addressed from the apps side, too. For example, images cannot be rotated in the Instagram app without disappearing! The camera is pocket-sized and encased in a smooth and solid plastic shell. Start-up time from standby is rather unpredictable. The camera is usually ready to shoot within 1sec, but the buttons and touchscreen can often take more than 10secs. The 10x optical zoom takes approximately 3secs to go from its widest to most telephoto settings, and macro AF offers a minimum focus distance of 10cm. With no manual-exposure control, it is worth setting up the touchscreen to its touch AF/AE mode. A large central portion of the frame is covered for this spot functionality, but it must be chosen instead for touch shutter or subject tracking. Storage is on SD memory card, but the camera also has 1.7GB of internal memory, 680MB of which is for downloading applications. A USB cable is supplied for charging the EN-EL12 battery, which has a disappointing life measured to the CIPA standard at 140 shots. If you enable GPS satellites for tagging images with GPS data, the battery life is even shorter. The comparable S6300 uses the same battery and offers a 230-shot battery life, while a smartphone would probably offer even more. An extra battery is therefore a worthwhile purchase.